The Grande Americano Mug breathes new life into thermal drinkware thanks to its fantastic selection of colours and variety of finishes. Whatever your colour scheme, you'll be able to find an Grande Americano to complement your brand. 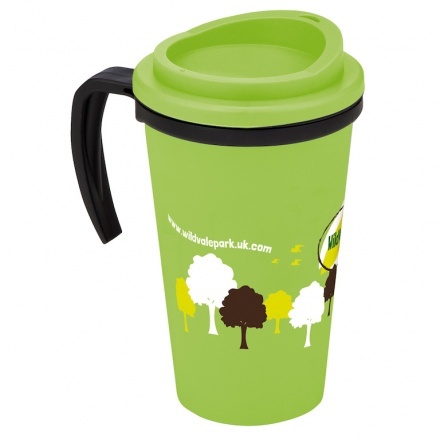 Manufactured in the UK from hardwearing double-walled polypropylene, the mug is virtually indestructible. Combine that with our high quality branding, and you've got a product your customers will keep and use for a long time to come. For added stability, the handle is moulded as part of the mug inner. Up to 4 colours print available. Lid: Aqua, Black, Blue, Green, Lime, Mid-blue, Orange, Pink, Purple, Red, White, Yellow. Grip: Aqua, Black, Blue, Green, Lime, Mid-blue, Orange, Pink, Purple, Red, Silver, White, Yellow.